Blues and rock titans collide in a Chicago club. In November 1981, fans attending the Muddy Waters show at Buddy Guy’s old club, the Checkerboard Lounge, were in for a treat. It’s not often one can catch one of the architects of the blues playing in an environment as intimate as the Checkerboard. What they may not have realized was, the Rolling Stones were in town that week, and several of them decided to check out the show. Not only that, all of them ended up on stage with Waters. Fortunately this historic event was captured on video, and is now available as the DVD/CD Muddy Waters & The Rolling Stones: Live At The Checkerboard Lounge Chicago 1981. Waters’ band starts the show with fine versions of the slow-burning “Sweet Little Angel” and the up-tempo “Flip Flop and Fly” before introducing the man of the hour himself. Muddy “Mississippi” Waters takes the stage and, in an instant, the night is transformed from good to something special. Waters straps on his Telecaster, leading the band through the laid back “You Don’t Have To Go,” which features George “Mojo” Buford on an inspired harmonica. Waters shows his considerable slide guitar talents had not been lost to age on a potent “Country Boy,” his band mates looking on in awe at the master at work. During a spirited “Baby Please Don’t Go,” in walk Mick Jagger, Keith Richards, Ronnie Wood, and Ian Stewart and it wasn’t long before Waters called Jagger to the stage to sing a verse. Not long after, Waters says, “What about Keith?” Jagger, sensing an opportunity to egg his partner on, says “Yeah, what about Keith?” Richards wastes no time joining the band on stage and the jam was on. Waters and Jagger continue to trade verses, and Keith takes an extended lead on the song. Jagger can barely contain his excitement, dancing and smiling on the stage. Before the song’s conclusion, Wood has joined the band on stage, making for a formidable guitar army. If that wasn’t good enough, Waters then leads the band through the classic “Hoochie Coochie Man,” with Jagger egging on his mentor during the verses and Waters returning the favor later in the song. The mutual respect between teacher and student is obvious and smiles abound on the stage. Stewart eventually joins his mates in the fun, as does Guy, who leads the group in a raucous “Next Time You See Me.” Guy, Richards, and Wood trade leads on this memorable jam, one of many the lucky fans in attendance witnessed that night. The included CD features highlights from the show, specifically the Stones portion of the set. The DVD includes bonus footage of the Stones in Hampton, VA, in 1981 performing “You’re Gonna Miss Me When I’m Gone” and their own blues number, “Black Limousine.” Both the DVD and CD feature remixed audio by Bob Clearmountain and the DVD has Dolby Digital Stereo, Dolby Digital 5.1, and DTS Surround Sound. For video that was never intended for the public, but had circulated in poorer quality copies on the bootleg circuit for years, the picture quality is quite good. Muddy Waters died less than two years after this performance. He never performed with the Rolling Stones again after that November night in 1981. 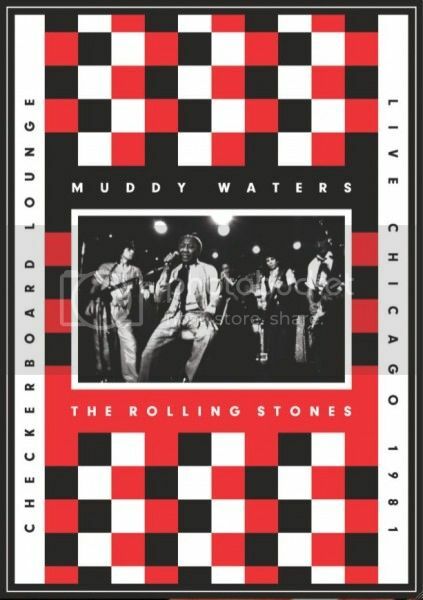 Today, we have a DVD document that proves what a great time Muddy Waters & The Rolling Stones: Live At The Checkerboard Lounge Chicago 1981 was.